Annie Veitch is a figurative oil painter from Ontario, Canada. Her large scale paintings of female figures explore the simple beauty of the body as well as the complexity of human emotion. 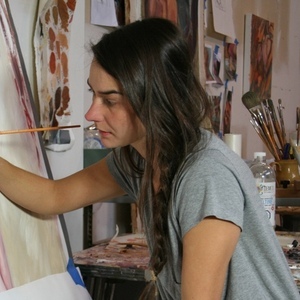 She paints figures against simple, subdued backgrounds. Portraying the bodies in such an environment not only allows the viewer to focus on the beauty of the figure but also, to interpret the painting without persuasion of physical surroundings. There is an emotional reaction that is based on the viewer's own feelings and experiences as well as their interpretation of the subjects.